Committed and driven to being part of a “different kind of organization” – driven to be part of a sought after team. It’s not just a piece of clothing at Slate Rock Safety. We know our products and the standards that go along with them. Business and government entities initiate programs to ensure the safety of their workers based on industry standards for safety, and the team at Slate Rock Safety can assist in selecting clothing to meet these safety needs. Customer service representatives and sales reps are continuously trained via in-house trainings, manufacturer trainings, webinars and more. Slate Rock Safety ensures that our customer-interaction teams know the answer, or are capable of finding it. At Slate Rock Safety, we are driven to automate and streamline technology and process for maximum efficiency. Our employees are our best assets, and the greatest return on investment occurs when they interact with customers. Continuously-improving technology compliments and facilitates relationship building and outstanding customer service. 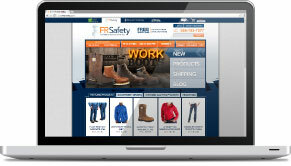 Internet marketing and traditional marketing have spurred the success of Slate Rock Safety. Active e-marketing campaigns including social networking and search engine optimization are integrated with traditional marketing methodologies to ensure a strong brand name for the entire company and each division. Slate Rock Safety has identified niches among their niche, and has used the art of internet marketing to target these audiences.